Have you ever considered the impact one untraceable email can have on an organization or individual’s career? With so much corporate information contained within email, it is not surprising that industries and governments worldwide are insisting that all email should be retained. Email archiving is no longer an option for organizations: undoubtedly it solves major problems that systems administrators face daily and it helps an organization fulfill its compliance and regulatory requirements, particularly those stipulating the retention of email for a period of time. The key to a successful implementation is choosing the right email archiving technology for that organization. 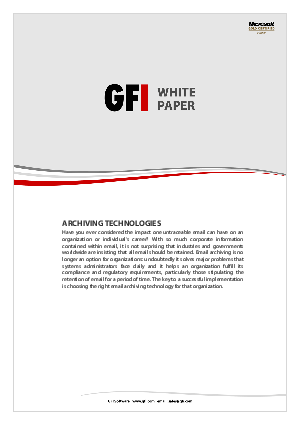 What archiving is and how it integrates with Microsoft Exchange or a messaging solution. What stubbing is and why Microsoft does not recommend the use of stubbing. How Journaling in Exchange can allow efficient email archiving. How does stubbing compare with Journaling?